This is the story that started it all. 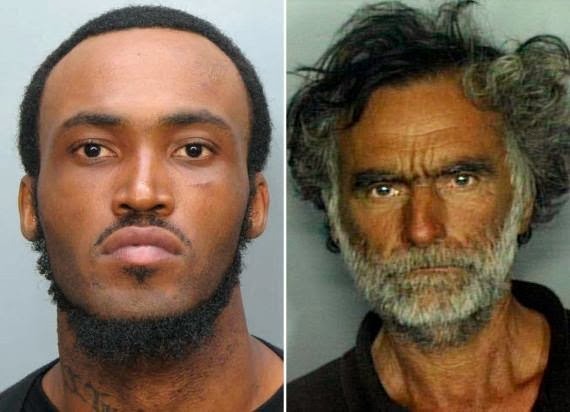 On May 26, 2012, Rudy Eugene (on the left in the image above) stopped his car on the side of MacArthur Causeway in Miami, FL. When the car wouldn't start, Eugene got out and began to walk. Under the relentless Florida sun, Eugene reportedly started acting erratically and removing all of his clothes, until he was naked and raving. He then came across a 65-year-old homeless man, Ronald Poppo, and savagely attacked the man. During the 18-minute attack, Eugene ate most of Poppo's face off to the bone. When bystanders yelled at Eugene to stop, he merely lifted his head and growled at them. Eventually the Miami Police arrived and had to shoot Eugene several times, killing him, in order to get him to stop eating Poppo's face. Though it will be months before the official toxicology results are revealed, the unofficial verdict is that Eugene was under the influence of bath salts, a powerful new hallucinatory drug. Poppo, age 65, was admitted into Jackson Memorial Hospital, critically injured, with 75–80% of his face above the beard missing and his left eye gouged out in the attack. He underwent facial reconstruction surgeries that took months to complete and remained permanently disfigured and blind. To combat the costs, a fund was set up and has collected $100,700 since July 17, 2012. Poppo, who lost sight in both his eyes, spoke to police, whom he thanked for saving his life, on July 19, explaining that Eugene, whom he hardly knew, approached him in a friendly manner but then, complaining he couldn't "score" at the beach and "souped up on something", started talk about how they were going to die, accused Poppo of stealing his bible, and, suddenly and without provocation, attacked and strangled him with wrestling holds, and then "plucked out" both his eyes. In the face of this, combined with Luka Magnotta's cannibalistic behavior and the murder of Kujoe Bonsafo Agyei-Kodie, people began to believe that the zombie apocalypse was at hand. As a result, the Centers for Disease Control and Prevention released a statement saying that the "CDC does not know of a virus or condition that would reanimate the dead (or one that would present zombie-like symptoms)."